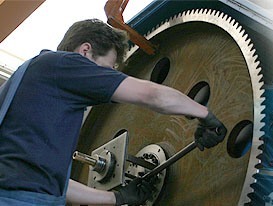 Crescent Machinery (Crescent) was formed in 1989 by Steve Jackson. Its aim is to provide quality new and used machinery to customers operating in the Metal Pressing and Sheet Metal Fabrication Industries. The first office was in a small rented unit in Harle Syke. This location was quickly out grown and the company relocated in Burnley, moving in 1995 to Glenfield Park, Nelson. A third move occurred in 2005 when the business relocated to Moderna Business Park, Mytholmroyd, from where it operated for 12 years. In 2017 Crescent became part of Group Rhodes and now operates from its 60,000sq.ft Wakefield headquarters. In 2001 Crescent fully acquired A Kinghorn & Company, trading as Kinghorn Machinery, one of the foremost manufacturers of Sheet Metal and Fabricating machinery in the UK and with an industry dating back to 1911 (for more information, please visit our Kinghorn page). Subsequently Crescent has changed its focus to aftermarket Service and Maintenance of all types of Sheet Metal and Fabricating Machinery. Today Crescent is the sole UK agent for a major European Press manufacturing Company, and is the agent or distributor for several other Metalworking and Metal Cutting Machinery manufacturers. The company has a stable workforce of experienced mechanical and electrical engineers and fully computerised customer support systems. The business is particularly proud of its rapid response and the quality of its service. Crescent Machinery offers full workshop facilities to enable the Engineering Service Division to undertake repairs in house, and on machinery of up to 50 tons in weight. The same infrastructure is also used for the rebuilding of machinery for resale. To complement this service a wide range of spare parts and consumables are kept in stock, such as Shear Pinions, Breaker Plates, Switches and Cutting Fluids.